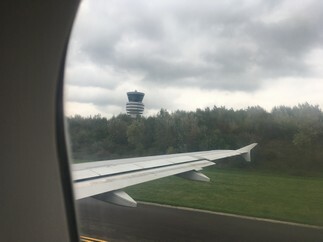 Circumnavigation Page 1 - leaving Belgium. Starting in the summer of 2017, we take Ngahue IV from Nieuwpoort down to Arrecife on Lanzarote as a first step towards joining the 2017 ARC. Every long voyage starts with a first step, as a well-known Chinese saying goes. Similarly, every long sea-voyage starts with a first leg. 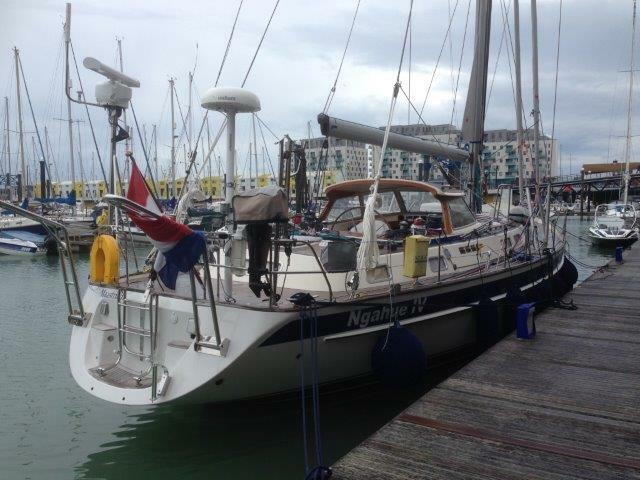 Our first stage of that first leg was from Nieuwpoort in Belgium to Brighton on the UK South Coast, a distance of approximately 100M, where we had planned to provision the boat because there is an ASDA superstore which is very conveniently located just opposite the marina entrance. In fact, we didn't just stay the one day for provisioning; we decided to stay two days. The weather was terrible and we quickly realised that leaving Brighton was going to be another very early start! The reason being that in order to leave with an adequate height of water under the keel, our departure time shouldn't be much later than 3 a.m. Thus the first three departures of our circumnavigation, from Nieuwpoort, Brighton and Portland all took place at 3 a.m. in order to catch either a favourable tide, or to escape being grounded at low water. 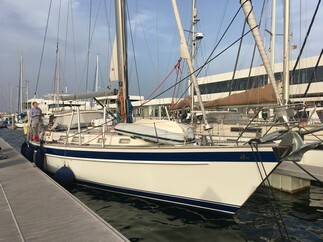 We'd experienced the effect of being "anchored" to the Brighton marina bottom with our keel in 2016. 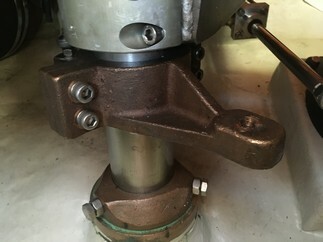 Though now, marina staff assured us that our berth had been properly dredged, and that we should have 2 metres depth at LW, we soon discovered this was not the case. In point of fact, we had a maximum of 1.4m depth at low water, so our heavy keel was very efficiently buried deeply in Brighton's soft mud. In "circumnavigation mode", Ngahue IV weighs well on to 28 tonnes. So we weren't about to try to motor out of mud and gave ourselves a wide margin when leaving our berth at 3 a.m. 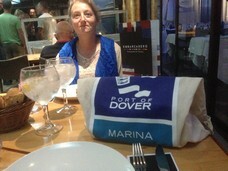 The second stage of this leg took us to Portland, and the third stage to Mylor marina in Falmouth. Our arrival and departure from Portland was quite uneventful. 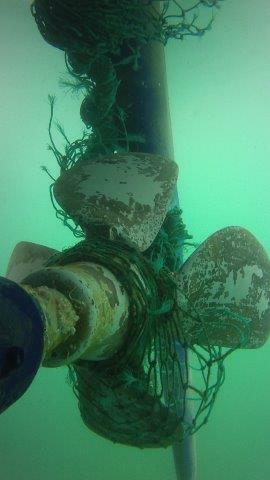 Unless of course you take into account the constant need to watch out for poorly marked lobster pots. Fishermen (surely not the professionals???) 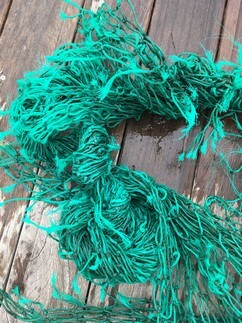 tend to use old white plastic containers and not enough rope to mark their lobster pots. So when there's a bit of current flowing, or at high water, these plastic drums are pulled just under the water surface. There they lurk like patient crocodiles in the dark for unsuspecting propellers to pass and foul themselves on these lines. Mylor can be a tricky place for a boat with our kind of draft at low water. 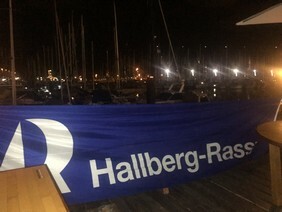 We were fortunate enough to arrive at nearly high water towards 8 p.m. Marina staff had conveniently pre-reserved a berth for us as we were the largest visiting yacht at the time and certainly needed the 18 metres or so of marina quay-side space that had been set aside for us. The wonderful English summer weather had picked up and we finished our food and non-food shopping for our trip to Portugal. 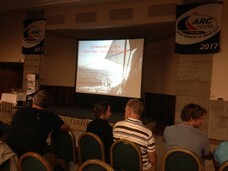 We had planned to sail straight from Falmouth to Sines in Portugal, and from there on to Arrecife in Lanzarote. Under these circumstances, it wasn't critical to leave Mylor marina early in the morning; having "filled her up" with red diesel (Belgian authorities would immediately sling us on a black list), we had enough water and diesel on board for an extended period at sea. Unfortunately, our plans changed en route as after two days of alternating sail & motor we experienced 2 full days of no wind and subsequently picked up a fishnet in our prop when off Cape Finistere (the photo shows what we managed to cut off and left on deck as a silent witness). 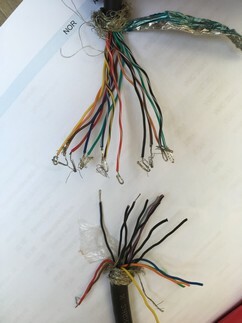 This incident obliged us to head for the nearest port where we could properly inspect our prop, and remove the remaining part of the offending net. After Laura had succeeded in cutting off as off much of the net as possible, we still ended up towing a large chunk of yellow-green net behind the boat. 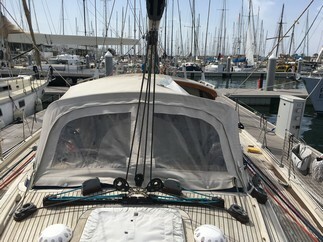 Looking at the charts and Reeds Almanac, we decided to put into Marina Muros in the Ria de Muros, which had all the facilities needed to lift a larger boat (if needed) and was completely protected from all winds (not that this was an issue at the time as there was no wind!). From where we took the net to the marina was about 4 hours of quiet motoring. We didn't want to force anything out of kilter, knowing that our boat was quite heavily laden. The harbour master's son, Pedro, turned out to be a diver and offered to remove the remaining part of the net so that we could continue our trip unfettered by fishermen's accessories! 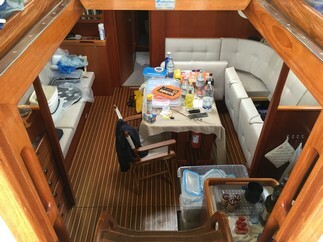 Unfortunately, the remaining part of the net (photo on the right) had removed a lot of antifouling (and perhaps more) from the skeg during the 4 hours of motoring. 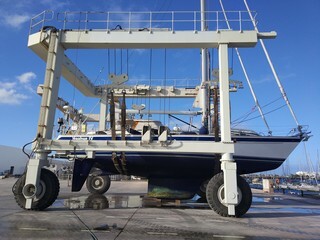 So the boat would need to be lifted soonish just to repaint that part of her! We took on a fresh load of diesel in Muros - filled the water tanks and set off on our next leg of the trip to Arrecife in Lanzarote, having enjoyed the quiet hospitality of Marina Muros and the delights of the local Gadis supermarket. Our next leg was about 6 days sailing away! It's a strange feeling for your average weekend and summer cruise sailor to set out on a trip for 6 full days and not touch a sail at all. When you pop across to England from Nieuwpoort for the weekend, you spend a lot of time adjusting sailings, going about, or doing other things as you dodge shipping in the Dover Strait's Traffic Separation Scheme. We left Ria de Muros in extremely dense fog. Using radar and our fog horn on automatic, we spent much of the morning motoring out to sea, looking out for lobster pots or poorly marked fishing nets. They must have been out there, but in the fog we didn't see anything. Much of the afternoon and early evening was spent motoring down the Spanish coast. And then, as our nautical Breton friend, Armel de Kerros, had predicted (I've learned in life that Breton sailors are nearly always right), the Portuguese trades kicked in around Porto. And within 15 minutes or so we went from a useless south-westerly to a very useful northerly wind. Which we kept for the next 5 1/2 days, with slight variations towards north-north-east or even a full north-easterly. So all we needed to do was unfurl the genoa and keep the wind at some 150° behind the boat. The wind was supposed to be a moderate Bft F4/5 (or so our Grib files said). But we encountered a pretty-much constant F5/6 and even 7/8 for a lot of the time. So sometimes we would roll away a bit of the genoa; and then roll it back out when the circumstances allowed. We made days of 165-170M (much better than I had originally hoped for). There was a fair amount of strain on the steering system, though, and indeed both our autopilots broke down. 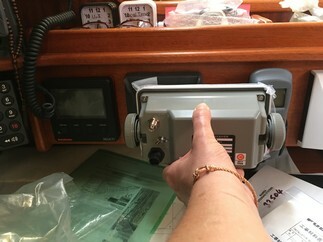 The two stainless steel pins that connect our main autopilot's Simrad-Robertson hydraulic drives to the rudder quadrant broke, leading to a sudden and unexpected "rudder fail" message on the Furuno pilot, which of course stopped working (see our first You Tube post for details). We switched over to the secondary Raymarine autopilot, which steers a Mamba drive linked to our steering system. After 2 days, the Mamba drive also decided to stop working ("Drive stopped"), which was rather disappointing given that Lewmar had charged us more than €2600 plus VAT just for this electric drive! Basically, that left us without any pilots at all. We resorted to hand-steering the boat for the last part of our trip, which surprisingly turned out to be less of a chore than we feared, even if our nights became quite short. And so this is where the first stage - a mere 5% - of our circumnavigation ended. 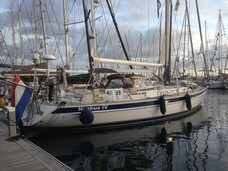 After some 1950M, sailed over 13 sailing days, 10 of which non-stop, Ngahue IV was safely moored in Marina Lanzarote in Arrecife. 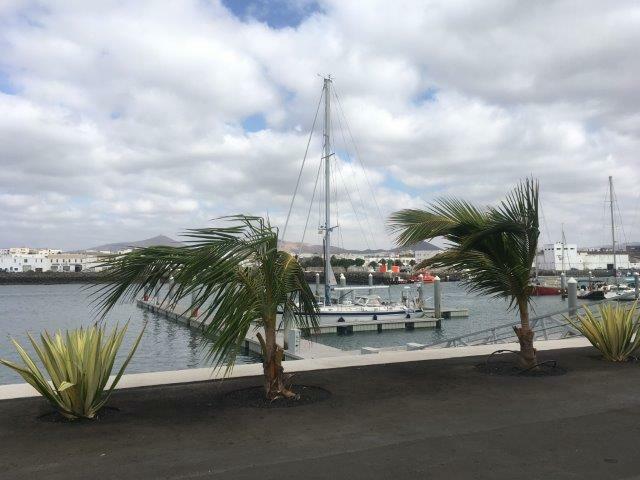 Our boat is pictured here, moored in sub-tropical Lanzarote... courtesy of Calero Marinas, the company that operates two marinas on the island. All we need to do now is sort out the two cooked Victron batteries, get the two broken drives of both our autopilots (Furuno and Raymarine) working again, check the alignment of prop & Volvo-Penta motor after our fishing net adventure, and to get the rig looked at and tuned (a couple of intermediates and our inner forestay are all pretty loose). 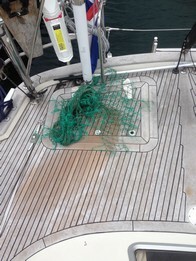 This shouldn't pose too many problems: Christian and Clive of Calero marinas are on to it! Come October, there was still a lot to do. And when people are working on your boat it's always motivating for them when the owner is on board and takes an interest in the work being done. So we decided that Laura would spend a couple of days on board and make us of the opportunity offered by a trip to Arrecife with Thomas Cook airlines to take an extra 30kg of gear to the boat. When we head off for a final trip back to the boat in November, our 50-60kg luggage allowance has already been taken up by the new Mamba drive, watermaker spares, a tripod and many other things.As indicated above, Christian and Clive of Calero marinas have coordinated several repair tasks for the boat whilst we were back in Brussels. 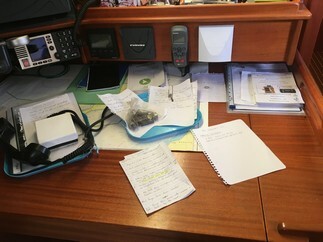 After 4 days of hard work, the boat was much better organised, but the chart table still has lots of little messages for Christian, Clive and Marco (no, not me, but Mr "electronics" Marco - based in Lanzarote - who will install a reconditioned VHF sub-station for our Thrane & Thrane Sailor main VHF that's at the chart table. The old substation was slightly defective, and we felt that having a working substation next to the wheel in the cockpit was important... 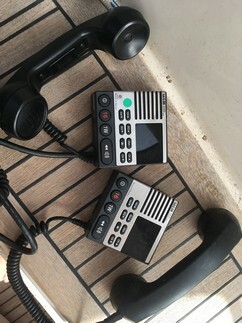 It saves runing down to the chart table to talk to a station that is just out of range of our several hand/held VHF sets. We'll also need to move around some displays at the chart table to accommodate out new Furuno NX300 navtex set: jobs for early November 2017. 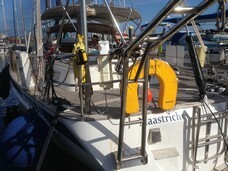 Also pictured our two new Victron AGMs - these are aft; another 4 are under the floor area next to the mast. 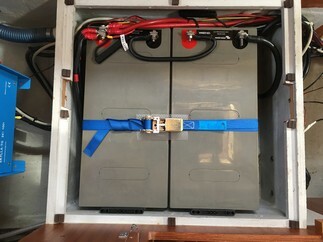 All three of our 220AH/24V groups have now been isolated and re-wired to eradicate the danger of being "cooked" as two of them were when we motored 48 hours the Bay of Biscay in windless conditions! November 2017 and we head to Lanzarote for the final countdown! We also had a surprise visit from Kamel Labibes, his wife Ana and daughter Maya (much grown up since we last saw her). For more on Kamel, see a picture of his venerable but beautiful Arpège called Bou Mou on the 2017 photo page... 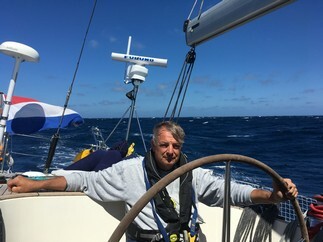 I used to skipper Bou Mou when I was quite involved in the Brussels sailing club and school "Du Vent et des Voiles" and its President, Marc Vermeulen in the period 2002-2005. 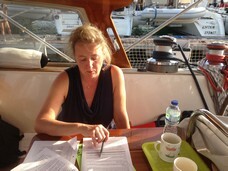 Kamel bought Bou Mou from Marc and sailed her to the Med, where he now sails her together with a local German friend. We had planned to leave Lanzarote on Friday 10th November and to arrive in Las Palmas on Saturday late morning on the 11th November - we duly programmed this into our plotter and AIS. But very strong winds pinned us into our berth, and the marina had moved a New Zealand flagged catamaran alongside the main pontoon, just in the essential manoeuvring space that we needed to swing Ngahue IV through the wind. 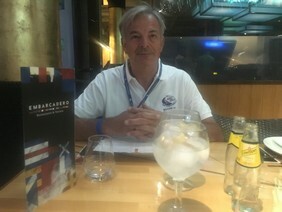 Because the wind was predicted to abate by Saturday morning, we stayed an extra night and left on Saturday 11th November (winds were indeed a lot more manageable), with us arriving in Las Palmas at 01:30 a.m. on Sunday morning. Quite an experience navigating through all the harbour lights and finding the marina holding pontoon. It had a useful empty space of the right size for us :-). This late arrival gave us just enough time later that morning to fill the boat with diesel fuel, take up our allotted space in the marina and participate in the ARC opening flag procession. As we headed towards the final departure date of the ARC 2017 (the 3rd Sunday in November being 19th November this year) our local suppliers turned up with water, juices, drinks and wine; meat and processed products; and fruit & vegetables. We ourselves made multiple trips to the local Hiperdino hypermarket (the best prices in the Canarias as an agitated male voicce keeps on reassuring us as we run around the aisles like headless chicken, ticking off essentials to buy from our multiple lists). 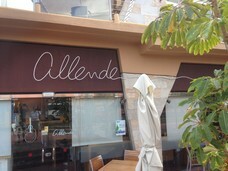 And not to forget that we had a special delivery from Hiperdino in Lanzarote. I guess we'll be one of those boats described in the Hallberg-Rassy hand-out as arriving in St Lucia with loads of food still on board... Anyway, as we are continuing our trip afterwards, all will be used and consumed in due course!